A female Bengal cat with tricolored rosettes and a clear coat. The Bengal cat is a domesticated cat breed created from hybrids of domestic cats and the Asian leopard cat (Prionailurus bengalensis) – the breed name comes from the taxonomic name. Back-crossing to domestic cats is then done with the goal of creating a healthy, and docile cat with wild-looking, high-contrast coat. Bengals have a wild appearance and may show spots, rosettes, arrowhead markings, or marbling. The earliest mention of an Asian leopard cat × domestic cross was in 1889, when Harrison Weir wrote of them in Our Cats and All About Them. The next recorded mention of an Asian Leopard Cat x domestic cat cross was in a 1924 Belgian scientific journal, and in 1941 a Japanese cat publication printed an article about one that was kept as a pet. The early breeding efforts always stopped after just one or two generations. Jean Mill was the breeder who decided to make a domestic cat with a coat like a wild cat. Jean Mill of California is given credit for the modern Bengal breed. She had a degree in psychology from Pomona College and had taken several graduate classes in genetics at UC Davis. In 1963, Mill made the first recorded deliberate cross of a domestic tomcat with a wild Asian leopard cat. However, Bengals as a breed did not really begin in earnest until much later. In 1970, Mill resumed her breeding efforts and in 1975 she received of a group of Bengal cats which had been bred for use in genetic testing at Loyola University by Willard Centerwall. Others also began breeding Bengals. In 1983, the breed was officially accepted by The International Cat Association (TICA). Bengals gained championship status in 1991. In 1997 The Governing Council of the Cat Fancy (GCCF) accepted Bengal cats. In 1999 Fédération Internationale Féline (FIFe) accepted Bengal cats into their registry. The Cat Fancier’s Association (CFA) was one of the last organizations to accept the Bengal cat into their registry. "The CFA board accepted the Bengal as Miscellaneous at the February 7, 2016 board meeting. In order for a Bengal cat to be registered with the CFA it must be F6 or later (6 generations removed from the Asian Leopard Cat or non-Bengal domestic cat ancestors)." In 1999 The Australian Cat Federation (ACF) accepted the Bengal cat into their registry. 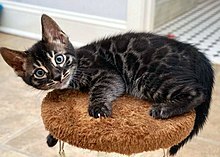 A charcoal Bengal kitten, with white "goggle" markings, and black rosettes. Bengal cats from the first three filial generations of breeding (F1–F3) are considered "foundation cats" or "Early Generation" Bengals. The Early generation (F1–F3) males are frequently infertile. Therefore female early generation Bengals of the F1, F2, and F3 are bred to fertile domestic Bengals. 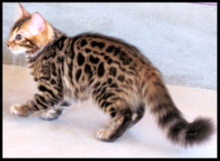 F1 hybrid Bengal females are fertile, thus they are used in subsequent, unidirectional back-cross matings to fertile domestic cat males. Some male Bengals produced viable sperm as early as the F2 back-cross generation: this is considered rare in the breeding communities, who regularly back-cross early generation females to late generation, fertile hybrid males. To be considered a domestic Bengal cat by the major cat registries, a Bengal must be at least four generations (F4) or more from the Asian leopard cat. The Bengal breed was more fully developed by the 1980s. "In 1992 The International Cat Association had 125 registered Bengal Breeders." By the 2000s, Bengals had become a very popular breed. In 2019, there are more than 1,000 Bengal breeders worldwide. * The 2019 number only represents the breeders who use the word "Bengals" in their cattery name, so it is likely that the true number is much higher. A brown Bengal cat stalking. This cat displays rosettes and spotting typical of the breed. Bengals have longer rear legs and carry their tails low. People most often associate the Bengal with the most popular color: the Brown spotted/rosetted Bengal. However, Bengals have a wide variety of markings and colors. Even within the Brown spotted/rosetted category a Bengal can be: red, brown, black, ticked, grey, spotted, rosetted, clouded. Many people are stunned by the Bengal Cat's resemblance to a leopard. Among domestic cats, the Bengal markings are perhaps the most varied and unique. The marble gene has been identified by Dr. Chris Kaelin (Stanford University Geneticist). Kaelin studied the color and pattern variations of feral cats in Northern California, and was able to identify the gene responsible for the marble pattern in Bengal cats. Marble is derived from blotched tabby by human selection, "butterfly wing" or "snail shell" is horizontally elongated, approaching the pattern of the clouded leopard. The underside must be spotted and the head must have the typical make-up of the tabby but in a very marked way. A UC Davis Bengal DNA test showing a cat carrying three recessive colors. The Bengal is an average to large-sized, spotted cat breed, "A Bengal's normal Weight: Males 5-8 kg (11–17 lbs), females 4-5 kg (8.8–11 lbs)." Bengals are long and lean. Bengals may appear larger than they are because of their muscular bodies. In New York City and the state of Hawaii, Bengal cats are prohibited by law (as are all other hybrids of domestic and wild cat species). In various other places, such as Seattle, Washington, and Denver, Colorado, there are limits on Bengal ownership. Bengals of the F1-F4 generations are regulated in New York state, Georgia, Massachusetts, Delaware, Connecticut, and Indiana - and banned outright in Australia. In the United States, except where noted above, Bengal cats with a generation of F5 and beyond are considered domestic, and are generally legal. At one time, Bengals were regulated in the United Kingdom. However the Department for Environment, Food and Rural Affairs removed the previous licensing requirements in 2007. Bengal cats are smart, energetic and playful. Many Bengal owners say that their Bengal naturally retrieves items, and they often enjoy playing in water. "Many Bengals will play for long periods with the faucet slightly running. They willingly get wet doing it too." The International Cat Association (TICA) describes the Bengal cat as an active, inquisitive cat that loves to be up high. Most Bengals enjoy playing, chasing, climbing and investigating. In general, Bengals enjoy action. Bengals are generally confident, curious and devoted companions. They get along well with other pets when properly introduced and enjoy being part of a family. Hypertrophic cardiomyopathy (HCM) is a major concern in the Bengal cat breed. This is a disease in which the heart muscle (myocardium) becomes abnormally thick (hypertrophied). A thick heart muscle can make it harder for the cat's heart to pump blood.. The only way to determine the suitability of Bengal cats meant for breeding is to have the cat's heart scanned by a cardiologist. "Hypertrophic cardiomyopathy (HCM) is the most common heart disease of the cat. As this condition becomes worse, the thickened heart muscle can cause obstruction to blood flow leaving the heart via the aorta increasing the effort needed to pump blood out of the heart"
HCM is a common genetic disease in Bengal cats and there is no genetic testing available as of 2018. The current practice of screening for HCM involves bringing Bengal cats to a board certified veterinary cardiologist where an echocardiogram is completed. Bengal cats which are used for breeding should be screened annually to ensure that no hypertrophic cardiomyopathy is present. Currently North Carolina State University is attempting to identify genetic markers for HCM in the Bengal Cat. Responsible breeders will screen their breeding cats annually or semi-annually. 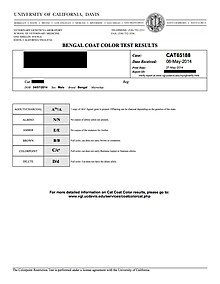 No genetic test for HCM exists for the Bengal cat as of 2018. One study published in the Journal of Internal Veterinary Medicine has claimed the prevalence of hypertrophic cardiomyopathy in Bengal cats is 16.7% (95% CI = 13.2–46.5%). Bengal cats are known to be affected by several genetic diseases, one of which is Bengal progressive retinal atrophy, also known as Bengal PRA or PRA-b. Anyone breeding Bengal cats should carry out this test, since it is inexpensive, noninvasive, and easy to perform. A breeder stating their cats are "veterinarian tested" should not be taken to mean that this test has been performed by a vet: it is carried out by the breeder, outside of a vet office (rarely, if ever, by a vet) The test is then sent directly to the laboratory. "(PRA-b) is an inherited, recessive gene which causes the destruction of the cells that register light in the back of the cat's retina. The loss of the cells begins around seven weeks of age and slowly progresses until the cat has very compromised vision by approximately two years of age." PK deficiency is a common genetic diseases found in Bengal Cats. PK deficiency is another test that is administered by the breeder. Breeding Bengal Cats should be tested before breeding to ensure two PK deficiency carriers are not mated. This is a test that a breeder must do on their own. A breeder uses a cotton swab to rub the inside of the cat's mouth and then mails the swab to the laboratory. "Erythrocyte pyruvate kinase deficiency (PK deficiency) is an inherited hemolytic anemia. Symptoms of this anemia can include: severe lethargy, weakness, weight loss, jaundice, and abdominal enlargement." the UC Davis Veterinary Genetics Laboratory has studied domestic cat blood type. They conclude that most Domestic cats fall within the AB system. The common blood types are A and B and some cats have the rare AB blood type. There is a lack of sufficient samples from Bengals, so the genetics of the AB blood group in Bengal cats is not well understood. Responsible Bengal breeders learn which recessive genes their breeding cats carry. The most pressing concerns when breeding Bengals are hypertrophic cardiomyopathy (HCM), progressive retinal atrophy and pyruvate kinase deficiency. Cat breeders must be aware of all current breed specific testing. Bengal breeders should do all available testing to ensure they are not breeding cats with health problems. HCM screening is a topic which Bengal breeders may debate. HCM can develop in their Bengal cats at any point in time, including soon after annual HCM screening. It is best practice to screen all Bengal cats used in breeding programs: HCM screening by a cardiologist is the only useful test that exists for Bengals and Bengal breeders in 2019. Responsible and consistent screening makes the breed healthier as breeders seek to eliminate cats that screen positive for HCM. Cat geneticist Leslie Lyons, who runs the University of Missouri's Feline and Comparative Genetics Laboratory, discounts such claims, observing that there is no such thing as a hypoallergenic cat: "You’re not allergic to the hair; you’re allergic to proteins that are in their saliva". Alleged hypoallergenic breeds thus may still produce a reaction among those who have severe allergies. Some long-haired Bengals (more properly, semi-long-haired) have always occurred in Bengal breeding. Many different domestic cats were used to create the Bengal breed, and it is theorized that the gene for long hair came from one from these back-crossings. UC Davis has developed a genetic test for long hair so that Bengal breeders could select Bengal cats with a recessive long-hair gene for their breeding programs. Long-haired Bengals are generally not recognized by cat registries; however, since 2013, they have "preliminary" breed status in the New Zealand Cat Fancy (NZCF) registry, under the breed name Cashmere Bengal. ^ a b Saulny, Susan (12 May 2005). "What's Up, Pussycat? Whoa!". The New York Times. Retrieved November 21, 2015. ^ Harrison William Weir, Our Cats and All About Them: Their Varieties, Habits, and Management, (Houghton, Mifflin & Co., 1889), p. 55. ^ Robbins, Nancy (1 February 2013). Domestic Cats: Their History, Breeds and Other Facts. Scotts Valley, CA: CreateSpace Independent Publishing Platform. p. 116. ISBN 9781300695424. Retrieved 9 March 2019. ^ a b Hamilton, Denise (10 March 1994). "A Little Cat Feat: A Covina woman's efforts at cross-breeding wild and domestic felines are paying off handsomely". Los Angeles Times. p. 2. Retrieved 27 January 2019. ^ a b c d Jones, Joyce (20 September 1992). "The Pet Cat That Evokes the Leopard". The New York Times. Retrieved 23 January 2019. ^ a b "Meet The Bengal: The Miniature Leopard of the Cat World". BasePaws.com. Retrieved 19 February 2019. ^ "Bengal Breed". TICA.org. The International Cat Association. 13 August 2018. Retrieved 8 March 2019. ^ "The Governing Council of the Cat Fancy". Gccfcats. GCCF. Retrieved 11 April 2019. ^ "Breed standards". FIFe. FIFe. Retrieved 11 April 2019. ^ "Bengals Take Their First Step in CFA". showcatsonline. Show Cats Online. Retrieved 10 April 2019. ^ "Moments in History of ACF". www.acf.asn.au. Retrieved 2018-01-10. ^ Davis, Brian W.; Seabury, Christopher M.; Brashear, Wesley A.; Li, Gang; Roelke-Parker, Melody; Murphy, William J. (2015). "Creation of Interspecies Domestic Cat Hybrids". Molecular Biology and Evolution. 32 (10): 2534–2546. doi:10.1093/molbev/msv124. PMC 4592343. PMID 26006188. ^ "TICA Registered Cattery Names". TICA.org. The International Cat Association. Retrieved 1 February 2019. ^ Conger, Krista. "How the cheetah got its stripes: A genetic tale by Stanford researchers". Stanford. Stanford University. Retrieved 10 March 2019. ^ "So, Do You Think My Cat Is a Bengal?". WildcatSanctuary.org. Sandstone, Minnesota: Wildcat Sanctuary. 2019. Retrieved 23 January 2019. ^ Brown, Alan. "Bengal Cats & Kittens". BengalCat.com. The International Cat Association. Retrieved 12 September 2013 – via The International Bengal Cat Society. ^ Wilson, Julia (2019). "Bengal Cat Profile – History, Appearance and Temperament". Cat-World.com. Retrieved 27 January 2019. ^ "Health Code of the City of New York". Title 24 Environmental Sanitation, Article 161 Animals. Retrieved February 28, 2019 – via Yumpu.com. 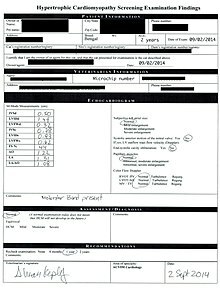 ^ "PQ – Non-domestic Animal and Microorganism Lists". HDOA.Hawaii.gov. State of Hawaii Plant Industry Division. Retrieved 28 January 2019. ^ Alessio, Kristine C. "Legislation and Your Cat" (PDF). 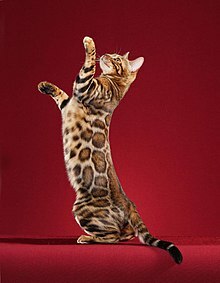 BengalCat.com. The International Bengal Cat Society. Retrieved 22 January 2019. ^ "Guidance on the Import of Live Hybrid Animals". Environment.gov.au. Commonwealth of Australia Department of Environment. Retrieved 22 January 2019. ^ "The Dangerous Wild Animals Act 1976 (Modification) Order 2007". Legislation.gov.uk. 4 November 2014. Retrieved 2 April 2016. ^ Jaccard, Laurent. "Bengal Cat Behaviors Explained". Bengal Cats. Bengal Cats. Retrieved 10 March 2019. ^ Jean S., Mill (1998). Guide to Owning a Bengal Cat. Neptune City, NJ: TFH Publications. p. 91. ISBN 978-0-7938-4663-4. ^ "Hypertrophic cardiomyopathy". MayoClinic.org. Mayo Clinic. Retrieved 22 January 2019. ^ Meurs, Kate. "Genetics: Bengal Cat Hypertrophic Cardiomyopathy Study". CVM.NCSU.edu. College of Veterinary Medicine, North Carolina State University. Retrieved 22 January 2019. ^ Longeri, M.; Ferrari, P.; Knafelz, P.; Mezzelani, A.; Marabotti, A.; Milanesi, L.; Pertica, G.; Polli, M.; Brambilla, P.G. ; Kittleson, M.; Lyons, L.A.; Porciello, F. (17 January 2013). "Myosin-Binding Protein C DNA Variants in Domestic Cats (A31P, A74T, R820W) and their Association with Hypertrophic Cardiomyopathy". Journal of Veterinary Internal Medicine. 27 (2): 275–285. doi:10.1111/jvim.12031. PMC 3602388. PMID 23323744. ^ "Bengal Progressive Retinal Atrophy (PRA-b)". U.C. Davis. ^ "AB Blood Group in Felines". VGL.UCDavis.edu. Veterinary Genetics Laboratory, University of California, Davis. Retrieved 23 January 2019. ^ Gunn-Moore, Danièlle A. (1 January 2011). "Feline Blood Transfusions: A Pinker Shade of Pale". Journal of Feline Medicine and Surgery. Retrieved 24 April 2016. ^ Kittleson, Mark. "Hypertrophic Cardiomyopathy HCM". BengalsIllustrated.com. Oroville, California: Award Winning Publications. Retrieved 21 January 2019. ^ See, e.g., this breeder-operated Bengals portal: "Bengal Cats—Are They Hypoallergenic?". BengalsIllustrated.com. Award Winning Publications / The International Bengal Cat Connection. 2012. Archived from the original on July 11, 2017. Retrieved April 7, 2019. ^ a b Dhir, Rajeev. "Suffering From Allergies? You Can Still Adopt a Cat". NECN.com. New England Cable News (NBCUniversal Media). Archived from the original on July 20, 2016. Retrieved 23 January 2019. ^ Schmitt, Kristen A. "There's No Such Thing as a Hypoallergenic Cat". SmithsonianMag.com. Smithsonian Institution. Retrieved 27 January 2019. ^ "Long-Hair Test for Felines". VGL.UCDavis.edu. Veterinary Genetics Laboratory, University of California, Davis. Retrieved 23 January 2019. ^ "Minutes of Executive Council Meeting, August 2013" (Microsoft Word). New Zealand Cat Fancy. Retrieved 22 December 2013. ^ "Agenda for Executive Council Meeting" (PDF). New Zealand Cat Fancy. August 2013. Retrieved 22 December 2013. Wikimedia Commons has media related to Bengal cat. This page was last edited on 17 April 2019, at 00:36 (UTC).